Washington: The US has accused Pakistan’s military-run ISI of providing financial, technical and physical support to extremist organisations and has given “concrete evidences" of the same to Islamabad, which has been facing the American heat for a while. “They (ISI) provide financial support (to extremist organisations). It provides technical support. It provides physical support. They (Pak officials) are allowing the safe havens to operate," a defence official told PTI on condition of anonymity as he is not authorised to speak to the media. A second defence department official said that Pentagon has been providing such evidences to Pakistan “since ages" but it is only after the recent attack on a hotel in Kabul and the US Embassy in Kabul that crossed all limits, the Defence Department decided to go public. The senior defence official maintained that these evidences gives concrete proof of the relationship between ISI and the extremist organisations including Haqqani network and LeT. 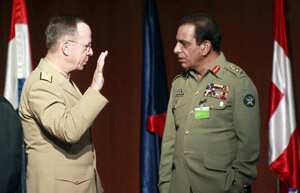 However, the official refused to give further details of the type of evidences that the US has provided to Pakistan, based on which Admiral Mike Mullen, chairman of the Joint Chiefs of Staff, told a key Congressional committee, last week that the Haqqani network “acts as a veritable arm" of Pakistan’s ISI.